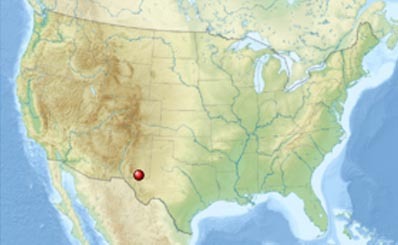 Carlsbad Caverns National Park is a United States National Park in the Guadalupe Mountains in southeastern New Mexico. 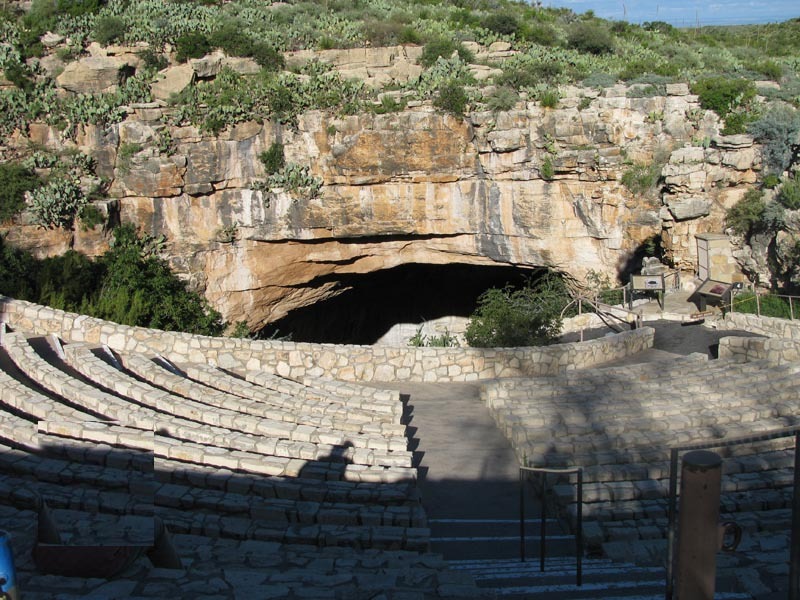 The primary attraction of the park is the show cave, Carlsbad Cavern. The park contains over 117 caves. 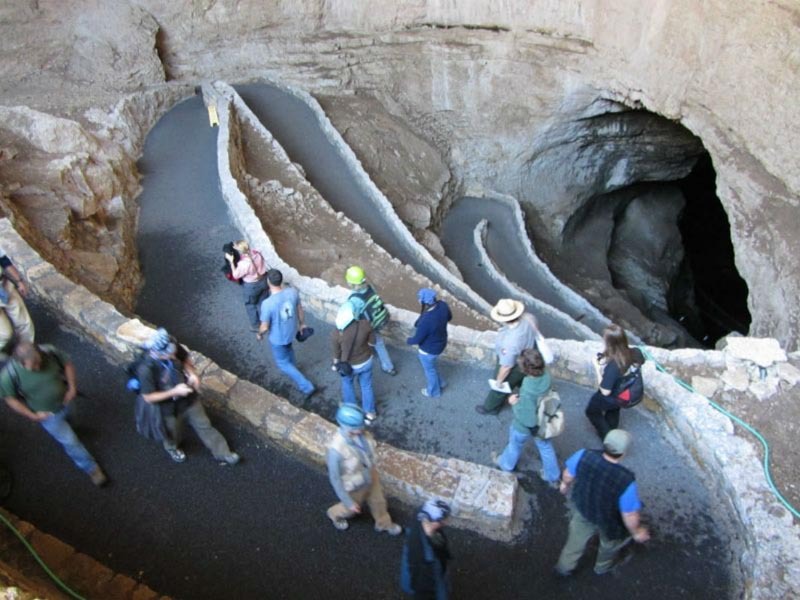 Three caves are open to public tours. excepted for designated paths for the guided adventure caving tours. 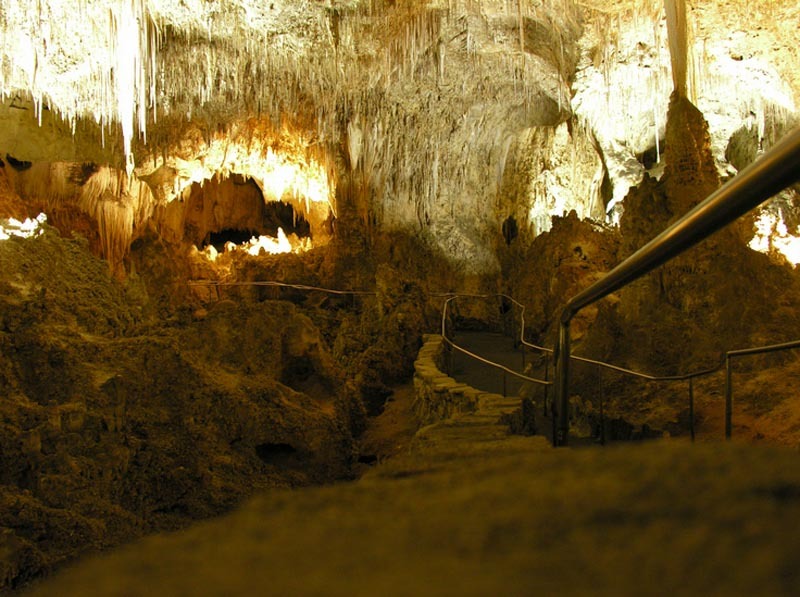 Carlsbad Caverns is the most famous and is fully developed with electric lights, paved trails, and elevators. 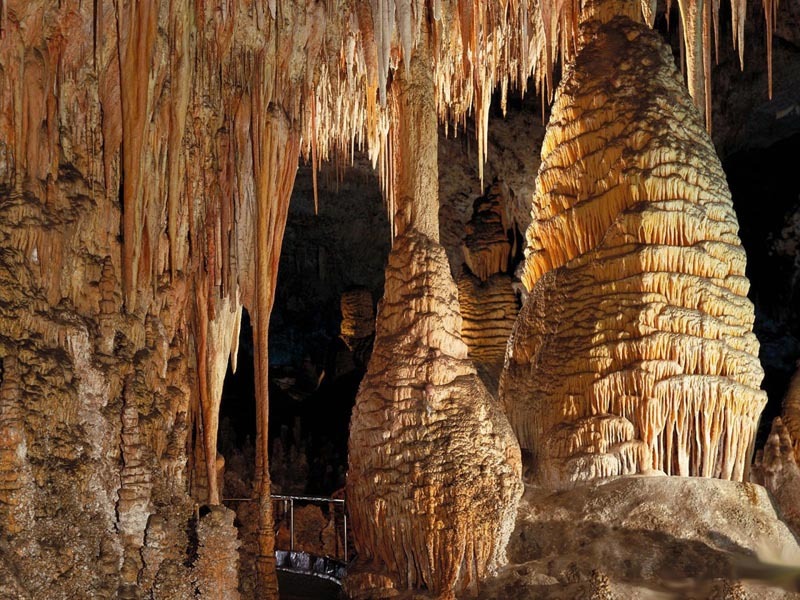 Carlsbad Cavern includes a large cave chamber, the Big Room, a natural limestone chamber which is almost 4,000 feet (1,220 m) long, 625 feet (191 m) wide, and 255 feet (78 m) high at the highest point. It is the third largest chamber in North America and the seventh largest in the world. 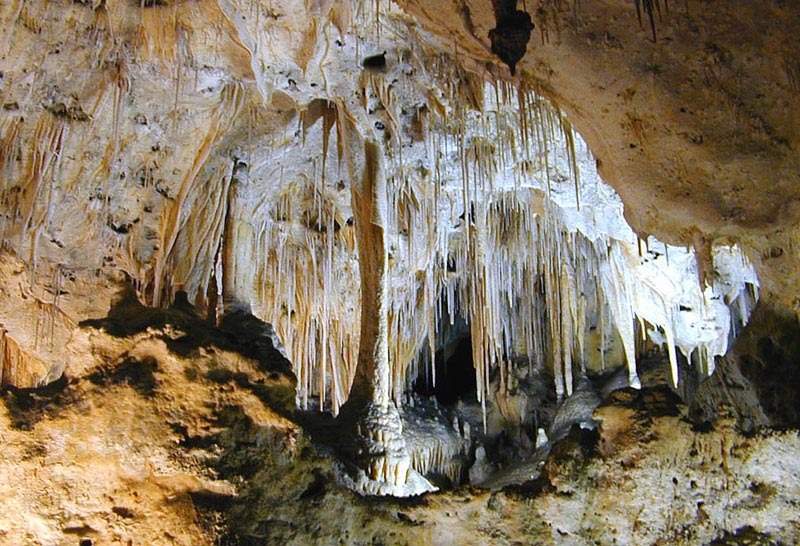 Lechuguilla Cave is well known for its delicate speleothems and pristine underground environment. Guano mining occurred in the pit below the entrance in the 1910s. After gaining permission from the national park managers to dig into a rubble pile where wind whistled between the rocks when the weather changed, cavers broke through into a room in 1986. Over 120 miles of cave passage has been explored and mapped. 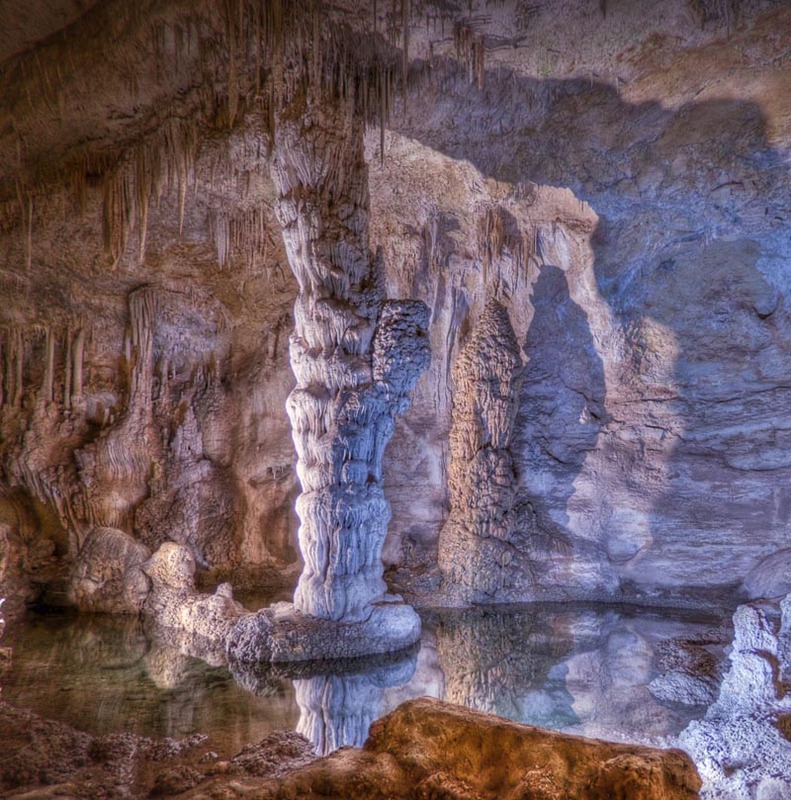 It has been mapped to a depth of 1,600 feet (490 m), making it the deepest limestone cave in the U.S. Welcome to 'Oz': After century of exploration, more pits, rooms and tunnels are found. 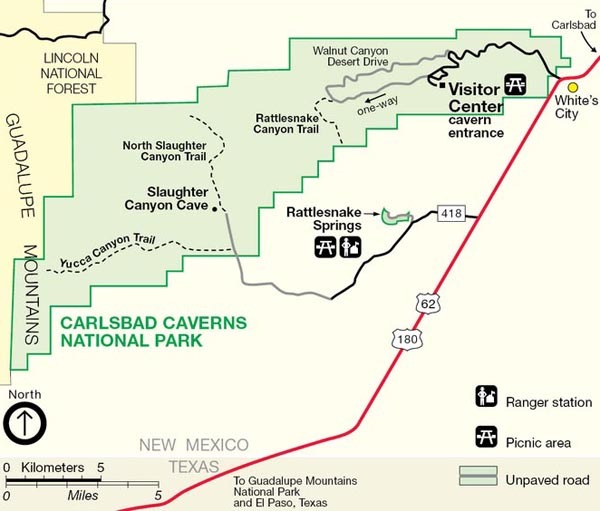 Despite being explored for more than a century, Carlsbad Caverns National Park still hides more passages. A team exploring the park's Lechuguilla Cave, the deepest cave in the continental United States, climbed over 410 feet (125 meters) into a high dome in early May. Upon reaching the top, lead climber James Hunter discovered a maze of previously unknown passages, pits and large rooms. The team named it Oz. One of the newly discovered pits, dubbed Kansas Twister, is 510 feet (155 m) tall, making it the largest vertical expanse yet discovered in the caverns. It's about half as high as New York City's Chrysler Building or Chicago's Sears Tower. The cavers use laser distance meters to measure the height from the floor to their final rope anchor. A large room, which they named Munchkin Land, measured 600 feet (183 m) long, 100-150 feet (30-46 m) wide, and 75-150 feet (23-46 m) tall. Lechuguilla Cave is known worldwide for its large rooms, unusual minerals, massive and fragile cave formations and scientific importance. This discovery heralds new areas for physical and scientific exploration. Ten cavers from Colorado, South Dakota, New Mexico, California and Arizona participated in the eight-day underground expedition that made these discoveries. Since mapping began in 1986, explorers have surveyed more than 134.6 miles (216.6 kilometers) of passages in Lechuguilla Cave. Because of the cave's delicate environment and scientific importance, only about 100 people, most of them vetted explorers and scientists, are permitted to enter each year. 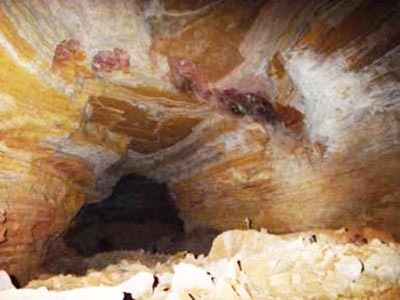 Most of the newly found section of Lechuguilla Cave is in a layer of rock called the Yates Formation, deep red, orange and yellow rock with relatively few stalactites and stalagmites. 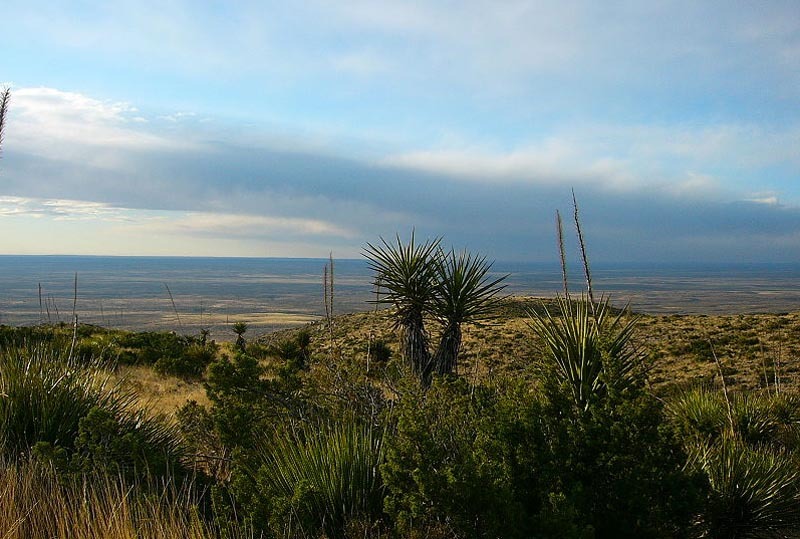 The untouched nature of Lechuguilla Cave has been a boon for research. A recent study published in the journal PLoS ONE found that ancient bacteria in the cave possessed a surprising degree of bacterial resistance. The Bottomless Pit was originally said to have no bottom. Stones were tossed into it, but no sound of the stones striking the bottom was heard. Later exploration revealed the bottom was about 140 feet (40m) deep and covered with soft dirt. The stones made no sound when they struck the bottom because they were lodged in the soft soil. Located in the ceiling above the main entrance hall, this small room was first accessed by tying a rope to a bunch of balloons and floating them up into the passage. Discovered in 1982, it is located in the ceiling above Lake of the Clouds. Its name refers to a Norse myth about a world in the sky that was accessed from Earth by a rainbow. The room was given this name because of its location above the Lake of the Clouds and its colorful oxide-stained formations. A maze of small passages totaling nearly a mile (1500 m) in combined length, discovered in 1993 above a mud-filled pit in the New Mexico Room known as Chocolate Drop. The uppermost of the "Scenic Rooms", it is named for a deep, malachite-colored pool in the corner of the room. In the 1940s, when the military was testing the feasibility of Carlsbad Cavern as an emergency fallout shelter, the Green Lake was used to look for ripples caused by a nuclear bomb test many miles away. None appeared.